LMU researchers have identified a signaling pathway that restricts cleavage furrow formation to the mid-plane of the cell. Cell division is a fundamental biological process which ensures that, following the replication of the mother cell’s genome, the two sets of chromosomes are equally distributed between two daughter cells. Chromosomes are segregated by the spindle apparatus, which is made up of fibrous protein structures called microtubules. The spindle apparatus is anchored to the opposite poles of the cell and determines the position of the future cleavage site in the middle of the cell, where a contractile protein ring is assembled. LMU researchers led by cell biologist Dr. Esther Zanin, who heads an Emmy Noether Research Group at the LMU Biocenter, have identified a molecular signaling pathway that restricts formation of the contractile ring to the mid-plane of the mother cell. Their findings appear in the Journal of Cell Biology. Aurora A, which is also present in human cells, is known to play a crucial role in the control of spindle assembly, and is activated on the astral microtubules. “We think that the active enzyme then diffuses from the astral microtubules to the cell membrane at the cell poles, where it suppresses formation of a contractile ring.” Zanin explains. 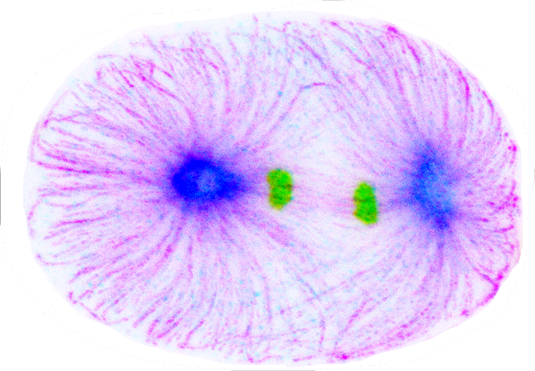 In multicellular organisms, the precise control of cell division is not only essential during embryonic development, but also in the adult organism. Defects in cell division can causes numerous diseases including cancers.“ A detailed understanding of this fundamental process is therefore a prerequisite for the development of more effective ways to treat and prevent such disorders,” says Zanin.